On Thursday, Miguel Cotto's legal adviser, Gaby Penagaricano, hinted that the WBA jr. middleweight champion was entertaining multiple offers when he wrote, "[Miguel Cotto] will be deciding in the coming days what his next fight will be. Stay tuned," on his official Twitter page. Although Cotto himself has been relatively quiet on the subject, most reports suggested that his options included Floyd Mayweather, Manny Pacquiao, and Julio Cesar Chavez Jr. There was even one rumor on the usually reliable RingTV.com alleging that he was negotiating a title unification with WBC jr. middleweight champion Saul "Canelo" Alvarez. Today, however, all signs suggest that perhaps Miguel Cotto has made a final decision. "Back in the US. What a productive week," wrote Penagaricano in the latest update to his Twitter page. Penagaricano had just returned from Mexico City, where Cotto was making an appearance on the ESPN Deportes program "Golpe a Golpe". On the surface, the post may appear to be insignificant, but it comes on a day when promoter Bob Arum revealed that WBO welterweight champion Manny Pacquiao has selected an opponent from a list of four choices, one of which being Cotto. 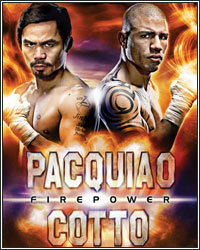 Although Arum refused to discuss Pacquiao's decision, his wife Jinkee would reveal, "He wants Cotto." Because bob arum is in the way of making the big fight happen, who do u think mayweather should fight next? One has to wonder if that was simply a ploy by Cotto to finalize an offer from Top Rank. When asked about the rumors of a Mayweather vs. Cotto clash that Friday, Arum would simply reply, "They are not going to get him." Whether or not an agreement has been reached by both sides remains to be seen, however, all signs are pointing to a potential rematch taking place on June 9, a date that Arum had previously targeted as Pacquiao's return to the ring.